Here's a little story about this magnificently, tasty, smooth, slightly spicy, addictive pasta sauce I once made. But first, let me tell you that I wish I had made a giant VAT of it to freeze. There I said it, the sauce was that good! Not to mention, the ingredients were SO SIMPLE and tasta....however, a bit laborious to make, not that I'm complaining. 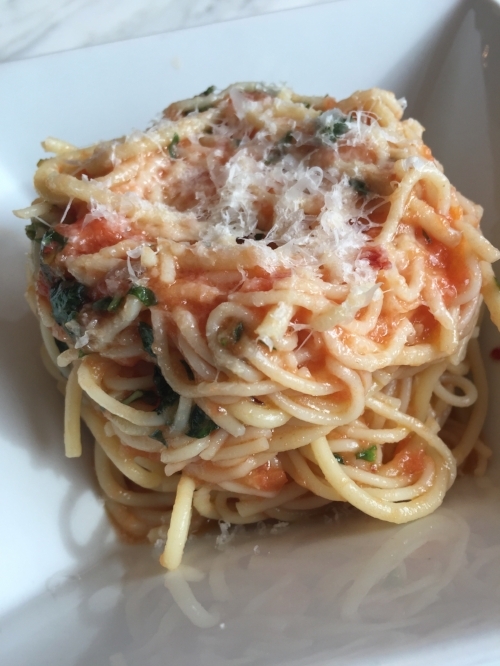 I first stumbled upon Scott Conant's Spaghetti Al Pomodoro sauce on Cupcakes & Cashmere. The blogger (Emily Schuman) fell in love with this chef's sauce years ago, only to discover that he resurfaced at LA's new The Ponte restaurant. She was happy to discover that her fave Spaghetti Al Pomodoro made the menu and she was on a mission to get the secret recipe (note: they serve it on their brunch menu, not the dinner menu). I can now see why she was so happy to re-discover this gem of a sauce. After reading the blog post, I thought why not try it myself? I was on a cooking binge and I love the idea of making simple, Italian fare that is homemade but absolutely delicious. I'm not one to buy any jarred pasta sauces because they are SO EASY TO MAKE! Even if its a bit of butter, EVOO and parm, pasta sauces are one of the easiest things to make and it can be done so many ways. I wanted to try and test this recipe out to really see if it was that good. So here I was, embarking on yet another culinary marathon and it kinda was. The sauce itself had a lot of steps, but the result was out of this world. Yet, SO SIMPLE! I think that's what I loved about it. I think anyone would enjoy it because it's that simple. Plus, its a dish that would easily be upward of $20 in a restaurant, so the fact that I could now make this at home and freeze the leftovers made my day. Oh, and Nathan's too. Ok, maybe I'm exaggerating a bit here but the most laborious part was prepping the tomatoes: blanching, peeling, cutting and de-seeding them. The recipe calls for 5lbs of tomatoes and I only did about 1lb, so make sure you leave enough time to do this. Once its done, you can now start infusing the olive oil with garlic. Easy peasy and I realized 'why hadn't I done this before when I wanted to infuse EVOO in other dishes?!' Once this was done I learned another trick: chili flakes will 'bloom' if you let them by soaking them in fat (EVOOT) so that I did. What did this mean? I googled it and here's what I found: this technique allows the seasoning to extract far more flavour than by simply simmering these ingredients in water or adding them to a dish. Because I didn't have a potato masher, I actually blended my tomatoes with its juice in a blender to make them smooth. Then I added them to the sauce pot with the infused chili flakes and garlic EVOO. I boiled, then simmered and once I turned the heat off, added the deliciously fragrent bunch of fresh basil to the dish to 'steep' until the sauce cooled. Once the sauce was cooled down, it was chow time. The key here is to boil the pasta as you normally would until el dente (keeping approx. 1 cup of the pasta water in case you need to add any to the sauce which I did not) then add a few ladles of the sauce to a sauce pan in addition to a few small knobs of butter. THEN you add single serving sizes of the pasta to the sauce and toss with 2 spoons or tongs (carefully). Lastly, I added more chopped fresh basil, and some fresh grated parm. This dish was amazing. It was just the right amount of heat from the 'bloomed' chili flakes, the consistency was perfect and the flavour was subtle but tasty enough to make me go for a second helping. Ok, third. Needless to say, I will be making more of this, freezing it and making it my go-to simple pasta sauce from here on it.